Three Rooms Press, 9781941110539, 192pp. The spirit of Dada continues to thrive in this stunning annual collection of provocative and disruptive Dada-inspired art and writing culled from a plethora of top international contributors, with 50+ color images. 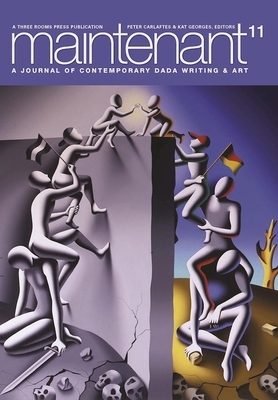 MAINTENANT 11: A JOURNAL OF CONTEMPORARY DADA WRITING AND ART is the latest edition of an annual collection of contemporary Dada work inspired by Dada instigator and Three Rooms Press spiritual advisor Arthur Cravan. This year's theme, "An Eye for a Lie," offers artists' responses to the increasing madness of the world, punctuated by creative anti-war art and writing. The journal is a full journey into the most imaginative minds in the world, showcasing work of artists and writers from more thirty countries on six of the seven continents. The journal is archived in museums worldwide. Peter Carlaftes is a New York-based screenwriter, playwright, actor, poet, and editor. Author of A Year on Facebook (humor), Drunkyard Dog and I Fold With The Hand I Was Dealt (poetry) and Triumph for Rent (3 plays). Co-director, Three Rooms Press. Kat Georges is a writer, poet, editor, director, playwright and designer. Author of Punk Rock Journal and Our Lady of the Hunger. Co-director, Three Rooms Press.